WATCH: Serbians Troll Visiting Joe Biden by Holding Rally for Trump! 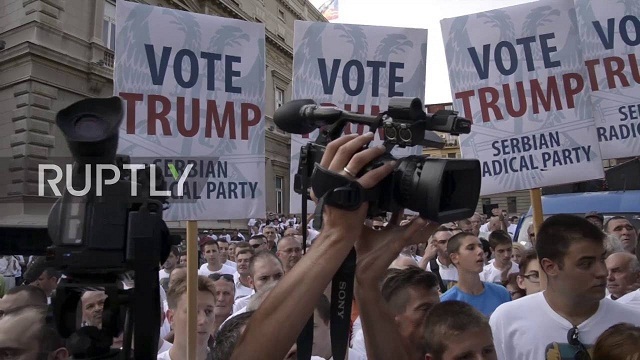 Our brothers and sisters in Serbia welcomed creepy Joe Biden to their nation by holding a rally for Donald Trump! Hundreds of supporters of the Serbian Radical Party (SRS) denounced the visit of the Vice President of the United States Joe Biden to the Serbian capital Belgrade on Tuesday. The crowd marched through the streets of Belgrade, headed by SRS leader Vojislav Seselj, before being stopped en route to the Presidency of Serbia by riot police. SOT, Vojislav Seselj, Serbian Radical Party leader (Serbian): "We gathered here today to protest because the criminal and villainous Joseph Biden has once again, with his presence, defiled sacred Serbian land." SOT, Vojislav Seselj, Serbian Radical Party leader (Serbian): "We came here, brothers and sisters, to tell him [Biden] that regardless of how much the leaders that govern Serbia at the moment crawl in front of him, that Serbia does not love him, that Serbia hates him, that Serbia finds Joe Biden disgusting." SOT, Vojislav Seselj, president of the Serbian Radical Party (Serbian): "But the time has come for America to erase a dark shadow from its history. The time has come for these bandits to leave the political scene. America now has hope and a future. America now has Donald Trump." SOT, Vojislav Seselj, president of the Serbian Radical Party (Serbian): "He is one of the few high ranking American politicians who asked for forgiveness from the Serbian nation because of the bombing [of Serbia in 1999]. He is honest, he is honorable, he brings peace to mankind and returns pride to America." Biden pictured left, the spirit of Serbia pictured right.